The Pub Out Back is an unlikely bar in a likely place. If that makes sense. It is tucked into a small space in a small strip of shoppes hidden behind the main drag of Olde Worthington. It is an easy place to miss. That is part of the charm of the place and why it is the pub out back. While Olde Worthington might not seem to be a pub crawl destination of choice, the area offers one of the best areas to do so, in a compressed block. In addition to easy to spot pubs like Old Bag of Nails and PK O’Ryans, the choices out front also call home to the bar at Rivage, House Wine, La Chatelaine and a really good happy hour at the bar of the Worthington Inn. Insiders, like Robert Kramer, of the independent village of Riverlea, know the upsides of the drinking choices of this mini-downtown and for folks like them, the Pub Out back was created. This small place packs quite a compressed punch. The front bar seats just over a dozen and maybe 16 or so more at five tightly placed tables. Upon entering, you might think you entered the Cheers of Worthington. Everyone does not know your name but they are glad you came. The front bar also features seven large screen TV’s which is what was missing from the other bars of Worthington – lots of large TV’s. Free peanuts in the shell were promptly offered upon arrival. While the pub does not have food service, like many successful bars, the owners forged an alliance with a nearby pizza place to provide quick access to food for eating with beer. There are 5-6 good drafts on tap and a deep selection of craft microbrews in the bottle to choose from. Hidden in a back corner is a barrel of games to share. While the place is small, it is not as small as I originally thought. In the back bar there are four tables, a few stools and a small table top shuffle board game of some sort. To show community pride a Worthington Cardinals image graces the wall in back. All in all a good bar especially for manly activities of drinking beer with other men interested in sports. I did my initial reconnaissance with The Drinking Duder. His response to our inaugural visit was “yeah, it was not bad.” In Drinking Duder terms, that means it was a good bar. As for me, my loyalties run deep with O’Reilly’s and St. James but since I have my hair cut nearby and I enjoy a bar off the beaten path, I think I may find myself back at the bar again munching on peanuts and cheering the next person to walk through the door. For quick directions. Turn west at the intersection of New England Ave. and High Street. Turn north into the large parking lot. Park your car near the northern fence line and follow that to the second line of shoppes. 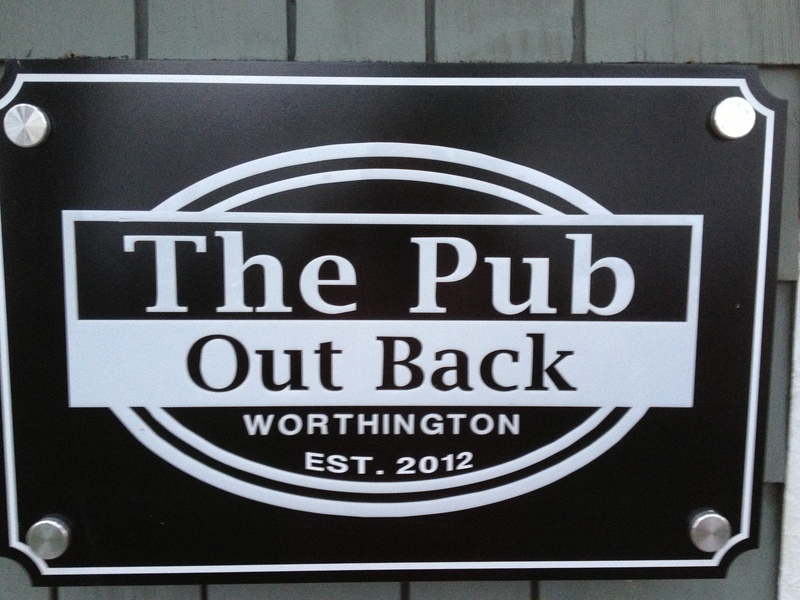 The Pub Out Back with be tucked at the end waiting for you to visit. This entry was posted on July 24, 2013 at 7:28 PM	and is filed under bar, beer. You can follow any responses to this entry through the RSS 2.0 feed. You can leave a response, or trackback from your own site.